Legendary IP-based games reborn on mobile platforms. November. 09, 2018 07:32. yes@donga.com. Nexon, Netmarble Games, and NCSoft, the big three South Korean video game developers, are releasing about 30 new mobile games en masse next year. It is drawing a keen attention whether the fleet of new games will prove to be a shot in in the arm for the local gaming industry, which remained in the doldrums in the year of 2018. On Thursday, NCSoft held a press conference and announced the plan to launch five new mobile games next year, including Lineage 2M, Aion 2, Blade & Soul M, Blade & Soul 2, and Blade & Soul S. This is the first that NCSoft has introduced more than four games in a year. The number of new games to be introduced by Nexon and Netmarble next year is also remarkable. 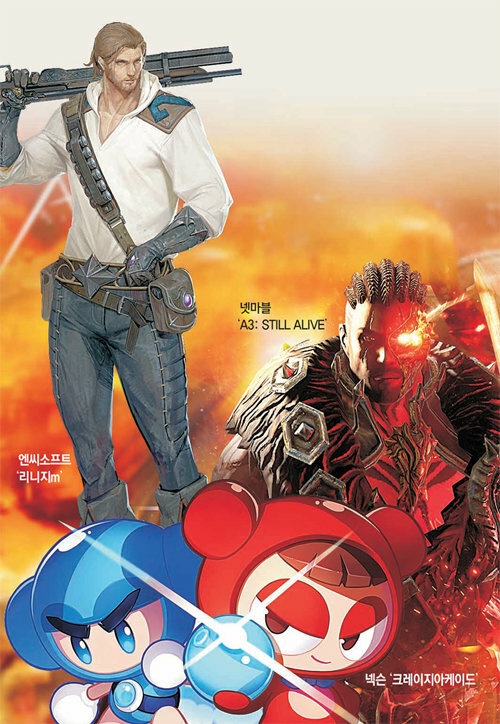 Nexon is rolling out 14 new games for the next year at Global Game Exhibition G-Star 2018, which will take place in Busan starting on November 15. Some of the new games to be unveiled in Busan include the mobile version of Kingdom of the Winds, Crazy Arcade, and Mabinogi, the IP-based video games released in the 1990s and early 2000s. Netmarble Games is also releasing 10 new mobile games based on the existing IP next year, including Catch Mind, Yachae Brukari, and Magu.